Let ring the jubilant music and set off the shining fireworks, because the circus is in town! The big ring is laid out and all of the acts are about to begin. It means it is time for some of the most daring and exciting acts this side of the state… but it also means that we’ll all be in need of someone to keep all of that chaos under control! After all, the lion tamer is there to keep those lions, the kings of the animal world, under control. Not to mention the tigers, bears, and even the seal. (That last one is the real trouble-maker! But, who is going to keep the lion tamer in check!? And that isn’t even the worst of it! You’ve seen the circus clowns. They’re all happy joy and goofy antics, but, everyone knows that there are all sorts of horrific tales of circus clowns gone crazy murderer. Any one of them could go nuts at any moment, and there are a lot of clowns! You’ve seen the cars. We’ve seen 47 come out of a single two-door civic and that was before it drove away, so you know there were at least a dozen more still inside! With all those energetic and goofy folks all over the ring, it comes down to you to keep everything under control. Fortunately, we have a way to help you do exactly that while also showing you’re your debonair style! 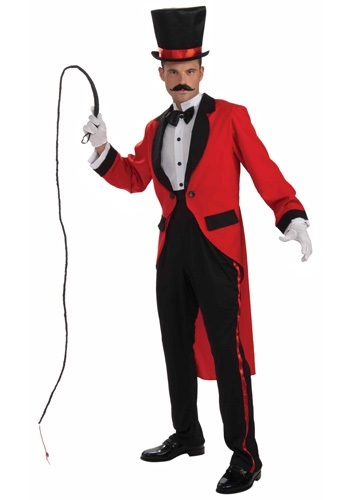 Hop into the role and also into this Adult Ring Master costume and you’ll be ready to whip those carnies into shape. The red polyester jacket has an attached button up shirt and features a long split coattail that captivates the circus leader look. The perfectly contrasting black pants, waist sash, and bow tie show your professionalism while that red screams style. Accessorize further with a top hat and lion tamer whip so you can assert your authority… and perhaps that wide handlebar mustache might make for a masterful move as well!